2016 is the year of music that just keeps on giving. Every week there is a new bundle of goods from bands around the world that scream at us for the label of “best of” for the year, and this past week in the world of metal has been no different. Today we take a look back some of the freshest bangers of the past week or so that you might not wanna play if your Grandma is in the house. It’s taken far too long for this band from Wollongong to get the recognition that they deserve, but this latest single might just be what does it for them. From the get-go, the song kicks you right in the teeth, with the gnarly guitar tones and beatdown drums serving as the perfect companion to the shrieking vocals. The video is both uncomfortable and disturbing, highlighting suburban violence. Mathcore veterans TDEP’s menacing new single will come as a bittersweet treat to fans, with the group confirming that this will be their final record. Dillinger has never played by the rules, and this time around they have ignored the book again, opting for a more mellow, brooding sound over their trademark hurricane of violence. Expect a more dynamic farewell from the prog 5 piece. Call it Dads trying to resurrect the glory days, call it cheesy, call it whatever the hell you want- but don’t you dare call this a bad song. After 30+ years of relentlessly touring, playing with orchestras and modelling Italian suits, Metallica can still thrash harder, faster and better than a majority of their contemporaries. This song has everything in it that made the band great in the first place – excessive wah pedals in the solo, some classic Lars Ulrich facial expressions and some of the best rhythm guitars you will hear this year. Horns up! Despite the endless amount of progressive bands that exist in the Internet age, I am still yet to find a band with such a masterful ability to fuse metal with other genres as Stockholm’s Opeth. Purists will be disappointed that the group is still yet to return to their death metal roots, but the song itself should make up for any disappointment felt by that fact. From the thunderous funk of the intro, the song drops into a sparse, gloomy interlude that is vintage Opeth, before erupting into an absolute shred-fest. Add into the mix a chaotic outro and you have one hell of a preview for their new album. This young Melbourne metalcore outfit just dropped their debut album, Children Of Chrome, last week, and this song is the perfect preview of what you can expect- a rhythmical intensity that seems almost like hip-hop at times, grainy guitars and some huge choruses. It’s the M15+ version of The Amity Affliction and that’s exactly what the local scene needs right now. Easily the most confusing addition to this list, the supergroup featuring members of Mastodon (Brent Hinds), Alice In Chains (William duVall) and the aforementioned The Dillinger Escape Plan (Ben Weinman) have dropped the last thing anyone would expect from such a lineup- a groovy, poppy dance-metal track. The video for the song is equally confounding, with members of the band brutally tortured and killed by a gang of dolled-up Barbie girls. The result is something Quentin Tarantino would be proud of and, given the left-field nature of the final product, it kind of works. 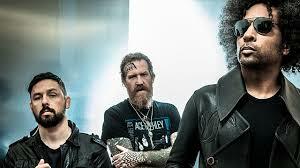 Video Roundup Giraffe Tongue Orchestra, Graves, Metallica, Opeth, The Dillinger Escape Plan, Void Of Vision. permalink.